New! Extreme Patterns is Finally On Line! 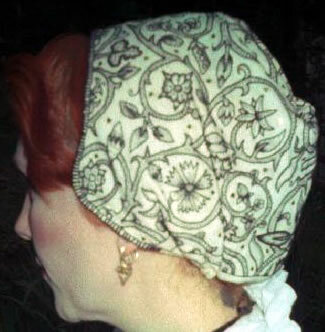 Reconstructing History is now carrying coif patterns by Extreme Patterns! 20 designs, all from period sources. Click Here! "Good enough"? That's for amateurs! * Here, we deal in EXTREME, my friend! *any accusations that I am, in fact, an amateur, are cheerfully admitted. Welcome to the home of Extreme Costuming! My name is Laura, and I'm a member of Gardiner's Company, Trayn'd Bandes of London (Elizabethan), a volunteer costumed interpreter and occasional researcher for the Jamestown Settlement and Museum (Early Colonial America), and a Laurel and a Pelican in the SCA (which has gotten me absolutely no free cups of coffee, darn the luck). I've been a member of Gardiner's for 14 years, involved with Jamestown for 17 years or so, and a member of the SCA (under the name Isobel Bedingfield, n�e Gildingwater) for 20 years. 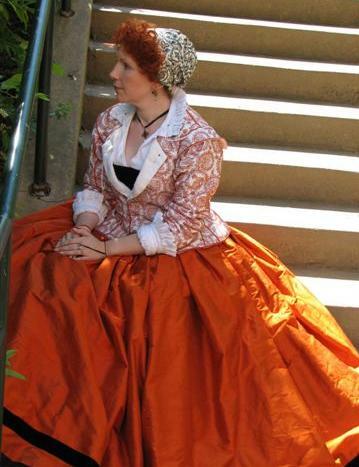 I've been sewing and making costumes since I was very young, but for the past fifteen years I've really narrowed down my focus to England during the years 1580-1620. It's a great period for detail and decoration, and they teach the Tudor/Elizabethan/Stuart period of history multiple times in English schools, so I'm more familiar with it than other periods. I come from England, and I grew up in London, so that country and city seem like a logical place to research. Now, what is Extreme Costuming, you ask? It's a slightly silly sounding name. But aside from that, it's a total immersion approach to costume and material culture. From a costuming standpoint, it's the crazy projects that take hundreds of hours to complete. It's creating the things that make people say "I could never do that!". It's the hand-sewn, the deeply researched, the complicated, the time-consuming. The correct materials, the correct sewing techniques, and an understanding of the complicated tapestry of politics, trades, occupations, and fashion that surround every single garment. I love costume, but I want more - I want clothes. I want to bury myself in the details that slipped past me when I was newer to costuming. I want the challenge. And if I do it wrong, I want to know how. It's costume research as a conscious choice. I'm not the world's greatest seamstress or embroiderer, but I love what I do - it makes me happy. And my philosophy is that if it's worth doing, it's worth doing right. Updates - Find out what's new, what's changed, and what's really going on in my tired little mind! The costume gallery - Elizabethan, other eras, the page of shame. The pictures that document my journey through time. Or, if you prefer the less pompous version, stuff me make - some good, some not so hot. Reproductions - The stuff that's actually based on a real garment or a picture. An in-depth discussion of pieces I made with slightly more than my usual attention to detail. Articles - The various classes and articles I've written about Elizabethan life and clothes over the years. New articles added fairly frequently. New! Apprentice Section! - Articles by my apprentices, in a separate section. The FAQs! - Did you ask a question in my blog? You might find the answer here (or in my blog)! Requests for information that I find interesting or relevant to the site will be answered in this section by my able assistants, Izzy the drunken doll, and the Attack Laurel Academy Dean (you know, if you think disturbing her is a good idea). All others, especially if they're long, will be answered in the blog. NOTE: The guestbook has been spammed beyond usefulness, so it's been removed. Ask questions using the contact information provided on the contact page. The Attack Laurel Academy - dispensing misery and insecurity (to other people) since 2001. Wander our unhallowed halls, check out the classes we have on offer, and make a vow to never, ever, be that evil. Unless you simply can't help it. Le Monde - The essays and ramblings of my misspent blogging, culled from previous and current blogs, arranged and sorted for your reading pleasure. A variety of thoughts and a wide variety of subjects, intended to be mostly humourous. You can judge for yourself whether they live up to the hype. Links - Places you should visit because I say so! And they're cool! Yeah! Note: Parts of this site are intended as parody. Please don't get your knickers in a wad and send me hate mail, I'll just delete it. Sensible comments, new research info, polite corrections, and of course, compliments are always welcome. Thank you for visiting, and enjoy your stay. 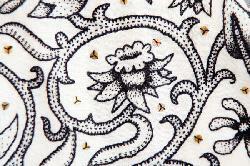 Reproduction of a coif in the Victoria and Albert Museum, London (detailed in Reproductions). Text and images copyright L. Mellin, 2000-2008, except where noted. All rights reserved.